Avocados are nutritionally awesome! And here are a couple of avocado recipes that’ll keep you wanting this superfood as a mainstay of your meal plan. The term “superfood” gets banded around a lot these days. And that’s usually because some questionable company wants to sell you their latest detox or supplement. But there are some cases where “superfood” is a very valid term. For me, the humble avocado deserves that title. And in this week’s meal prep Sunday I’ve got a couple of avocado recipes for you to savour. Not only are these recipes quick and easy, but they take the taste levels to new heights. First and foremost, before we dive right into the detail on this one, it’s worth repeating one of the key principles of dieting. And this is the calories in vs calories out equation. Because without a calorie deficit in place, it doesn’t matter how “super” a food is, you’re not going to be losing weight or fat. However, it’s also true that not all calories are created equal. Some have more positive effects on the body than others. So it’s worth knowing and considering this when making your food choices. And with that in mind, let’s just look at some of the facts and benefits of our friend the avocado. Second of all they contain TWICE the potassium of a banana and are very low in sodium! And this is a good thing because it helps you keep a good potassium / sodium balance. Avocados have a high percentage of fat. But this is the good monounsaturated kind. An average avocado packs around 23g of fat. So you still need to keep an eye on those macros. Fourthly, they help the body regulate cholesterol in the healthy range, which reduces the risk of heart disease. Finally, they contain ALL the essential amino acids the body needs. Added to that they have a bunch of fibre, making them easy for the body to digest. So, I think you’ll agree these little green fruits are up there in the Superfood stakes. And you don’t just have to throw them in a dull salad to get the most out of them. These avocado recipes I’ve got for you are going to make you want to keep them part of meal plan, forever. Toast the bread in a toaster or oven. Cut the tomatoes in half and chop the basil, then place in a small bowl. Drizzle with olive oil and season with salt and pepper. Half the avocado, remove the pit and spoon out the flesh, then cut into thin slices. Add the avocado slices and season with pepper and a little salt. Top with the tomatoes and serve. Preheat oven to 180C (355F). Half the avocado and remove the stone. With a spoon scoop out a bit of the flesh to make some more room for the eggs. Place the avocado on a baking tray and drizzle the avocado halves with the lime juice and season with salt and pepper. 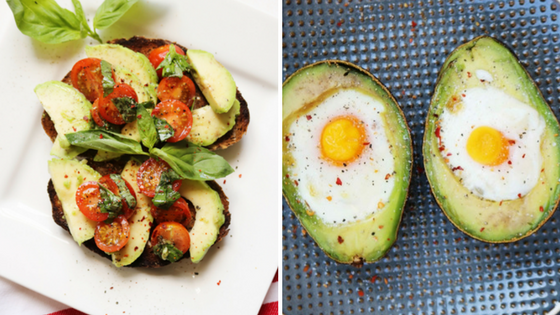 Break an egg into the centre of each avocado and bake for about 15-20 min or until the egg is cooked. Once ready season with salt & pepper, top with some lime juice and chili flakes, and serve. There you have it. Once you’ve worked those awesome recipes into your meal plan you’ll have made perfect use of this great little ingredient. So, make the effort to plan you meals ahead of time and get in the kitchen to try these new dishes. And what’s more, these avocado recipes will help you break the cycle of boring Tupperware meals. These are meals the family can enjoy for a change! The recipes in this article are great, but how they fit into your overall diet plan is the most important thing. Because if your calories and macros aren’t planned correctly, these awesome recipes could actually work against you! If can answer ‘YES’ to any of questions below, then I’ve got the solution that can help you. And best of all, it’s absolutely FREE.